We are a family owned business providing post frame or pole building construction services in northwest Wisconsin. Through leading material manufacturers and quality craftsmanship we are able to provide an exceptionally low maintenance building. Some situations call for a conventional style garage or stick built to fit your building needs. No problem, we build conventional garages as well. At Your Way Builders "YOUR WAY" means the design and style to fit your needs. Looking to get your recreational equipment out of the elements? Want a garage for your vehicles? How about a shop for your hobbies? Does your livestock need shelter? Is it time for a building to operate your business from? 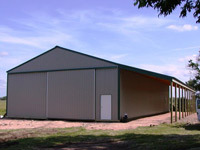 Do you live in Wisconsin and need a pole barn? The answer to these questions are just a phone call away. We are dedicated to helping answer your questions to find the right type of building for you.